You’ve navigated to my website, and I’m glad you’re here. That’s me tap dancing at a subway stop in Chicago. I’m a pretty lucky guy who has had some unique experiences like zip-lining as a duck mascot, turning-around a previously challenged software system implementation, and being the first driver of a one-of-a-kind, world-recognized, branding vehicle. How did it all start? I think it had something to do with being born on Friday the 13th to the Queen of Fun and an Einstein/Twain mashup. I was destined for a life of energetic playfulness and thoughtful communication. As a result, I’ve discovered that hiking trails can lead to unknown mysteries, a single image can illuminate an entire life story, and work projects can become year long roadtrips full of team building destinations, interests, and activities. My adventurous outlook coupled with a desire to be effective has given me a strong work ethic that has been noted since entering the workforce at age 13. Since then, I’ve held professional positions including kayak and sailboat salesman, wedding DJ, Wienermobile Hotdogger, instructional designer, IT analyst, and customer experience director. Through these positions, I’ve learned how to quickly connect with colleagues and leaders and was recognized for my quiet confidence and creative spirit. Equally comfortable in cross-functional executive meetings or one-on-one with customers, I thrive on efficient decision making enabled by open communication and playful spaces. The pages below review my experience and provide some specific examples of what was accomplished. I hope that you enjoy reading about them as much as I enjoyed doing them. I look forward to connecting with you about you and your experiences. Wealth Management had been a completely foreign industry to me and proved to be an exciting learning opportunity both professionally and personally. I worked with financial advisors that served credit unions, and I had to become fluent in their language, systems, and needs. What started out as technical training quickly grew into leadership, and after 2 years, I was promoted to the position of Director of Advisor Experience. My responsibilities grew from creating eLearnings and delivering software training to being the voice of our customer - financial advisors. Channeling the voice of the business and its financial advisors in the development of a roadmap for efficient account opening and client reporting. Prioritizing user-requests and vendor-enhancements with an understanding of interrelated complexities. Coordinating with technical partners to identify and resolve data architecture and data integrity issues. Strategizing with partners to ensure supporting communication, marketing, and training plans aligned with the enhancement roadmap. Collaborating with the VP of Marketing on determination of appropriate partner for large-scale customer segmentation, journey mapping, and experience prioritization. When a trauma patient arrives in the ER and requires a cardiac cath as a result of heart attack, cardiologists and nurses don't want to be thinking about software. Preparing these users and supporting their system use under pressure are skills I honed while assisting radiology and cardiology departments across the country. My introduction to the healthcare industry came as a result of working at the headquarters of Epic Systems, the leading electronic medical record provider. After training system analysts and hospital administrators on application build, I transitioned to serving individual healthcare organizations as an instructor designer and classroom trainer so that I could take a more active role helping care providers. My services included workflow analysis, training material creation, mock system environment build, learner assessments, classroom training, and go-live support. I often joined a project after an abrupt resource departure and have developed a method for documenting and tracking progress during the critical crunch-time prior to go-live. My contribution to and organization of these projects is frequently noted, and I’m proud of my ability to present confidently even when there could be uncertainty behind the scenes. "We are so fortunate to have had Bill join our team. Bill is professional, prompt, well-organized and has been an invaluable addition to the training team." I've frequently been referred to as a salesman with nothing to sell but smiles, and what better way is there to spread miles of smiles than on the hotdog highways of America in the 27 ft. Oscar Mayer Wienermobile? I became an Oscar Mayer Hotdogger immediately after college and proudly graduated from Hot Dog High with Class 19 earning the name, "Big Dog Bill." While haulin’ buns, I visited 38 states, gave out 1000s of Wiener Whistles, drove in the US’s oldest Fourth of July parade, and created local media buzz with the PR agency on wheels. Because one year of hotdogging is never enough, I returned to Oscar Mayer for a truly once in history experience - the launch of the MINI Wienermobile, a MINI Cooper turned into a hotdog on wheels. This second tour started with three months traveling in a semi-truck that was converted into one frank-tastic showcase. It had a kitchen, a movie theater, and a mirrored wall vehicle showroom. After the top secret, “Something Big is Coming” tour, I got to be the very first MINI Wienermobile Hotdogger participating in its reveal on Good Morning America and in The New York Times. While organizing high school pep rallies, I realized I had a knack for entertaining and engaging crowds. This led to my 'first business,' Impressive Phrequencies, a DJ service for high school dances and graduation parties. I continued DJ’ing into college, and a few years later, became one of the most requested wedding DJs at a local company in State College, PA. Through the local DJ network, I was able to connect with radio stations and soon found myself filling in for weekend and evening shifts on the region’s top 40 station, Beaver 103. The station also had a mascot: Bucky, and I had the unique experience of bringing Bucky to life at events ranging from snowtubing to car lot sales to racing the Nittany Lion in Beaver Stadium. Mascotting quickly became a way for me to spread smiles across town. Wowy 97.7, a sister station to Beaver 103, used Hootie the Owl to animate their events. I even decided to dance in the streets as an oversized owl during the concurrent time of my college graduation. "I get nothing but positive comments from all of Bill’s clients regarding not only performance, but his approachable and friendly demeanor as well." Creating...mini-golf courses, refrigerator box photo booths, websites, welcoming environments, and shareable experiences...has been a part of my being since birth. I was fortunate to have early digital tools to start translating my ideas into beings with my family’s first computer, a Commodore 64. I then took formal classes in Pascal, Fortran, Basic, C++, and Visual Basic allowing me to understand the building blocks of coding. As the internet emerged, I started exploring web design with Microsoft’s Frontpage and then Macromedia’s Dreamweaver and Flash. I now subscribe to Adobe’s Creative Cloud and frequently use Photoshop, Indesign, Premiere, and Animate to bring creations to life. I believe it is these creative skills coupled with my natural interpersonal talents of building innovative and collaborative spaces that has greatly contributed to my professional success. These examples provide a summary of my student, professional, and personal work. Additional samples are available on request but restricted due to copyright and proprietary rights. Visuals, images, artwork, treasures, stories… adventures! I see photography as a way to share my worldview and experience of feeling joy in the day-to-day. My photography turns an image into an adventure: a flower becomes a faerie’s record player, tossed clothing becomes a biography, the world becomes a schoolhouse, and a rodent becomes a colleague. During the jurying process of joining the Madison Art Guild, a judge commented on my work by writing, “...I want to see more.” ...and I want to create more! I later became the newsletter and MailChimp administrator for the organization and also exhibited my work in the Bindley Collection of Middleton, WI. If life is what we make of it, I've turned my world into a playground. "I can HEAR your smile when you speak. It's wonderful!" While working for a DJ company, I was asked to help the organization explore additional revenue sources...from mechanical bull rides! 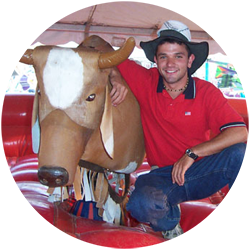 “Thunder” and I traveled to local carnivals and bars providing wild rides and giving out Bucking Bullshirts. It was with Thunder that I earned the nickname "Wild Bill," and it has resurfaced many times throughout the years. While traveling around the country, I would stay busy by treasure hunting for unique and colorful shirts. However, after leaving the road, those shirts could have just collected dust. To help bring a little color and fun to the office, I started Fun Shirt Friday at a number of employers. Although I'm frequently the only participant, that doesn't make it any less of a thing. "Your attitude is contagious, Bill!"